Setting up a new house and for that matter a kitchen when you are a newlywed and staying away from your hometown is a pretty tricky job. All those gifts received during the ceremony – the dinner sets, OTGs, induction cookers, crockery are either too fragile or too bulky to be carried along to the new habitat (city). So, this is my recent status – setting up a new kitchen. And, there comes the idea of a new post to help those who are in my state or is going to set up a kitchen soon. Here’s the first of the three post collection of how to set up a Bengali kitchen from scratch. You can also check Kitchenistic to find kitchen product reviews that will help you to set up your kitchen in a better way. Saying this, I have a feeling of déjà vu. Some years back when I shifted to Bangalore for my post grad, I started eating at the nearby restaurants. But, eating outside for days together in a city, where even the basic ingredients are so different from your own has its toll on your health, taste buds and of course the pocket. So, I started cooking at my PG. Now, I have an experience on setting up kitchen for bachelor as well as for a family of two. So, here is how to set up your Kitchen so that you can . The saying goes “Maach-e Bhaat-e Bangali”, (fish and rice makes a Bengali). So, to start with the first thing needed to set up a Bengali kitchen is a handi and a kadai/ karahi (wok). According to the wiki page of handi, it’s a round bottom Indian cooking vessel with a smaller mouth. Handi is especially used to prepare rice and also rice preparations like payesh (rice pudding) or pulao. Though, I prefer preparing rice in a handle-less saucepan. The karai is an indispensable item in the Bengali kitchen. Whether it’s a fish curry or dal and even fried, it is used everywhere. So, if you are planning to setup a Bengali kitchen, then better have at least one handy. Khunti or the pancake turner is a must have in a Bengali kitchen. Just like the wok it is used everywhere – from preparing curries to frying veggies. Along with this a ladle for serving gravy items and a tempering ladle will set you rolling in the kitchen. There are different types of whisks that are available in the market. The most common being the balloon whisk. Though, I still prefer the very Bong dal-er kata (a special type of whisk with fan-like blades attached to the end of a long rod), a balloon whisk for blending lentils and preparing lassi (if you are yet to buy a blender) is good enough. I have seen my mom, grand mom, aunts and next door aunty using a bonti to chop vegetables and also cut and scale fish. Bonti is a carved knife, attached to a heavy wooden base. But, it’s just next to impossible to carry a bonti from your hometown, so let’s resort to knifes. When I first started cooking I had just one knife. It was the first time I used one, and the first couple of weeks I had a hard time adjusting. There are sets of 6 or 10 knives available, so if you want you can own one, or else just start with just one. Add a peeler and a grater to your list of cutting items. Scissor always relates to cutting papers during those craft periods in school. But, to tell you the truth it is really handy in the kitchen also. I have a pair and I use it for opening packets, chopping herbs and also cutting fish fins and tails. If you are a bachelor or just a newly-wed like me then a couple of plates, glasses and a few spoons and serving bowls and spatula will be good enough for you to start with. But, just to be on the safer side and also if you want to entertain a few guests over the weekend go ahead and buy a nice dinner set. But before you go on about inviting guests or conducting ceremonies, it is good practice to always keep the house clean, or more so the dirtiest places, like a kitchen, immaculate. You would be surprised to now get professionals online to help you out with your cleaning. So, call Maid Easy today and get it done in an expeditious manner. The above items are pretty much to start a small kitchen. 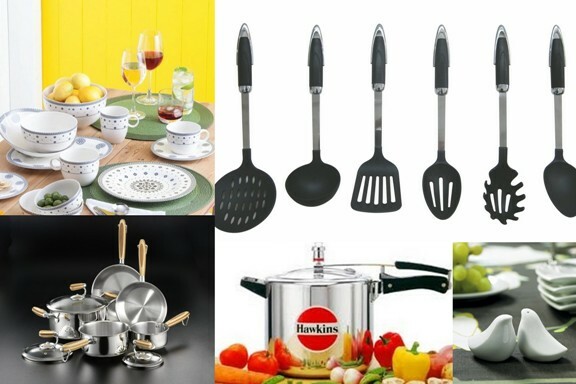 There are some more things that you may like to buy.Many kitchen tools and appliances can be found at a discount online, using a Sears coupon code. A rolling pin and a board, if you are an expert in roti making or want to learn how to prepare a perfect roti/chapatti. Or else, just buy a roti maker. A griddle or tawa for preparing chapattis and even pan cakes or dosas if you want. A colander, if you want to save the pain of holding the handi while straining the extra starch from cooked rice. Colander also comes handy while washing vegetables and especially useful for cleaning the leafy ones. And, to make your work easier there are many electronic items that are readily available – food processor, rice cooker, toaster and how can I forget the oven-toaster-grill (OTG) or better still a convection microwave oven. The photos are downloaded from web search, if anybody has any issues with the copyright of the photos please let us know, we’ll remove the photo. Thank you! What a great idea to try the Mexican arts or culinary stores. I’ll keep you posted if i find anything interesting to share. I’ve enjoyed your blog postings often, and i love the name “Cook Like a Bong”! Having lived in the US for nearly thirty years, i have what one would call a fully equipped kitchen. I have been on the lookout, however, for utensils and dishes that are truly deshi in nature, and hard to replicate with Western inventions. For example, i managed to find a countertop “narkel kurani” or coconut grater. I have a small “sheel pata”. Although i rarely use it, it is comforting to know it is there when i want just the right texture for somethings that even a blender cannot do. The only thing i cannot find are clay pots that are appropriate for kheers and firnis and dois. Terracotta pots from nurseries are suspect because one doesn’t know if the clay contains heavy metals or other contaminants not suitable for food contact. Does anyone know where i can find “clean” clay pots or dishes? I didn’t find it in any retail stores, but I found quite a few items in Amazon. You can try it out. Otherwise, you can try out some of the Mexican art and artifact stores, they keep those things. I don’t think you’ll get exactly the size and shape of the clay pots we use back at home to keep doi/ firnis, but these will serve the purpose.